Russians in the 1970s did not care for American soul music, but did have an appetite for soft-rock like “American Pie” by pop star Don McLean or “Free Man in Paris,” by singer-songwriter Joni Mitchell, US diplomats said in a January 1975 cable released by WikiLeaks Monday. WASHINGTON, April 8 (RIA Novosti) – Russians in the 1970s did not care for American soul music, but did have an appetite for soft-rock like “American Pie” by pop star Don McLean or “Free Man in Paris,” by singer-songwriter Joni Mitchell, US diplomats said in a January 1975 cable released by WikiLeaks Monday. The cable was one of a new batch of 1.7 million US diplomatic communications from the years 1973 to 1976, that WikiLeaks published on its website on Monday. Dubbed the “Kissinger Cables” by WikiLeaks after then US Secretary of State Henry Kissinger, the records cover a variety of diplomatic traffic including “cables, intelligence reports and congressional correspondence,” WikiLeaks said. “Believe ‘soul’ genre not of top interest here, and suggest priority consideration be given to ‘soft rock’, ‘blues/rock’, or ‘country rock’,” a cable sent by the US embassy in Moscow to the State Department said. The diplomat who wrote the cable was trying to coordinate a tour of the Soviet Union of a US band, and suggested that A-list musicians be approached with the idea of performing rather than “lesser-known, more derivative” groups. Among the acts that would, in the diplomat’s opinion, likely go down well on a Soviet tour would be “soft-rockers” Bob Dylan, James Taylor, Don McLean and Joni Mitchell. Lynyrd Skynyrd was named as a blues-rock band to approach, and Poco and The Nitty Gritty Dirt Band were suggested as country-rock bands that might captivate a Soviet audience. The music genres, while mainstream in the United States of the 1970s, would be “new for Soviet tour, as would most aspects current music,” the diplomat said in the cable, adding that the time was “ripe to make attempt” to bring US rock music to the Soviet Union. 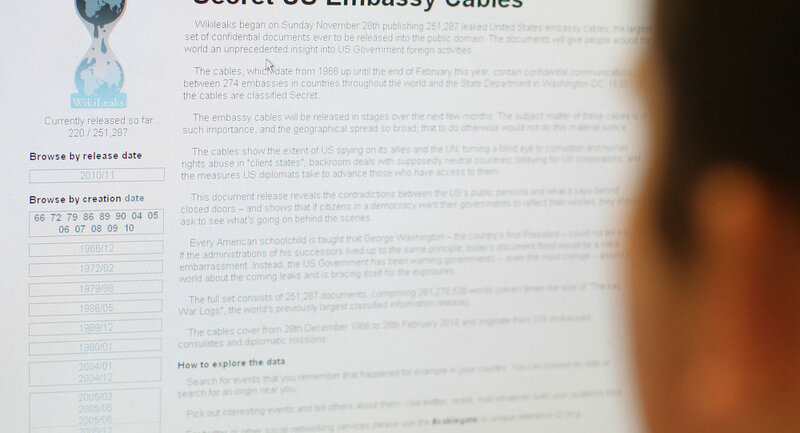 The newly released documents will be included in WikiLeaks' PlusD collection (Public Library of US Diplomacy), said to be world's largest searchable collection of US confidential and once-confidential diplomatic communications.